Recently there have been huge developments in Linux 6LoWPAN support. Old linux-zigbee was renamed to more appropriate linux-wpan. Openlabs released an excellent tutorial on running 6LoWPAN on RaspberryPi. With it you can get running 6LoWPAN Border Router, even if you never compiled Linux kernel before. Openlabs also released 802.15.4 module for RaspberryPi - it is very reasonably priced, works as advertised, and is currently best choice to quickly start development. Delivery with USPS seems fast too (12 days to Poland, Europe in my case). Following my previous experiments with Grinch Border Router, I decided to try to take it one step further, and run RPL routing protocol on top of RaspberryPi with 6LoWPAN. My results below. Following Openlabs advice, I decided to go with linux-wpan-next branch. I had one problem running this branch on RaspberryPi - Ethernet stopped working. I found solution on elinux.org - the bug was caused by missing USB config directives in kernel. Take extra care to enable both CONFIG_USB_DWC2_HOST and CONFIG_USB_DWC2_PLATFORM in your kernel config. The steps above should give you working RaspberryPi with eth0 and lowpan0 interfaces. After that your RaspberryPi is be ready to communicate with RPL nodes. If you want to use your RPi as a Border Router there are other steps to take: enabling IPv6 forwarding, configuring IP address on eth0 interface, running radvd on eth0 interface, etc. Remove other OF definitions if present. With this modification, your Contiki nodes should join DODAG formed by RaspberryPi. I noticed nodes are slow to rejoin DODAG after restart. RPL for Linux is usable. Joao Pedro Taveira's implementation seems to work with Linux 3.17 and 6LoWPAN (after minimal patching). This is very surprising, that implementation is no longer developed. Linux box is a superior solution for Border Router than any embedded system. Open Source's inefficiency is sometimes amazing. 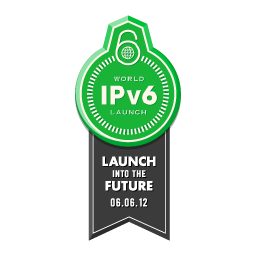 June 6th, 2012 is World IPv6 Launch Day - a worldwide event for Internet providers, website owners and institutions. Every organisation is invited to participate - to join the event it needs to enable IPv6 for its products, websites and users. The event is supposed to promote IPv6 transition, and hopefully, to start a chain reaction. I think that everything has been already said about IPv6 and its adoption process, but I'll repeat once more, that it has to be done. The sooner the better. There are many technologies waiting just around the corner, which can be developed only with larger address pool and end-to-end connectivity provided by IPv6. The action has a very nice badge and catchphrase, but it doesn't describe the titanic amount of work that has to be done by network engineers, webmasters, programmers, and help-desk employees. The costs of this transition might be enormous. But still it has to be done.